This summer hanging in DC, I spent an afternoon at the National Arboretum. Such an amazing place - 440 acres full of trees, plants, flowers, gardens right in the city! While the plants made an impact on me, I also loved this wall clock I spotted in the main building. Honestly, I think this clock was put up when they opened in 1927 :) It's lovely and completely perfect for a small space. 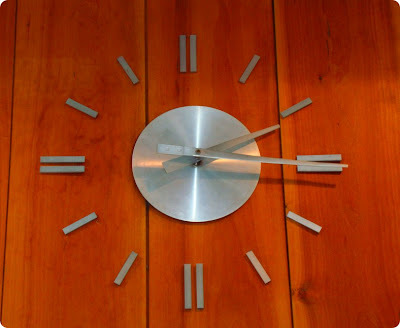 I'd love to give this clock a shot in my own small space, maybe surround it on one side with an art gallery or placing it over a vintage credenza? It looks like a doable DIY. Very stylish and elegant! And so versatile, stylistically. Love it!